Now is the time to become a sponsor of the 2018 Fall festival. Sponsorship starts at $200. What a way to step up! The JCC Sonoma County's Jewish Film Festival is a true community event, and it was never clearer than on our 2017 opening night, when people who were evacuated or lost their homes in the fire, filled the theater to be together in what was the first county-wide Jewish community event during the firestorm. 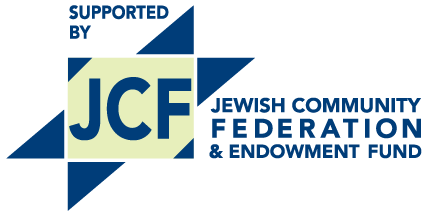 JCC Sonoma County's Jewish Film Festival is a program that is entirely supported by the community. Your generosity is the only reason the JCC can continue to present Sonoma County with the best International Jewish Films for the 23rd year. Since ticket sales cover only 30% of our overall costs, we need your help! Please, consider making a commitment to our great festival - become a Film Festival Sponsor. Sponsorships start at $200 and include advertising opportunities and tickets to see all the films. We are currently programming our 23rd season. Our reputation for showing quality films keeps expanding every year, both within and beyond the Jewish Community. 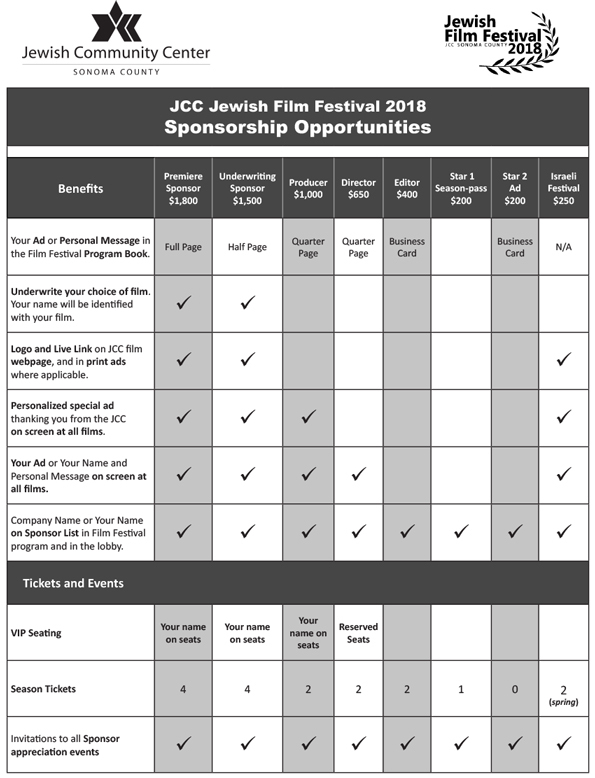 Your sponsorship will guarantee that we can continue to secure the best, current, Jewish films for our community’s festival. We would also like to interest you in supporting the Israeli Film Festival to help us carry this new tradition into its 4th year. Here is what you can get, depending on the level of sponsorship you choose. Season tickets to watch ALL the films in the festival. Your or your company’s name on the sponsor list in the Film Festival program, and in the theater lobby. Your Ad or your Name and Personal Message on the screen at all films. A personalized special ad on the screen at all films thanking you from the JCC. 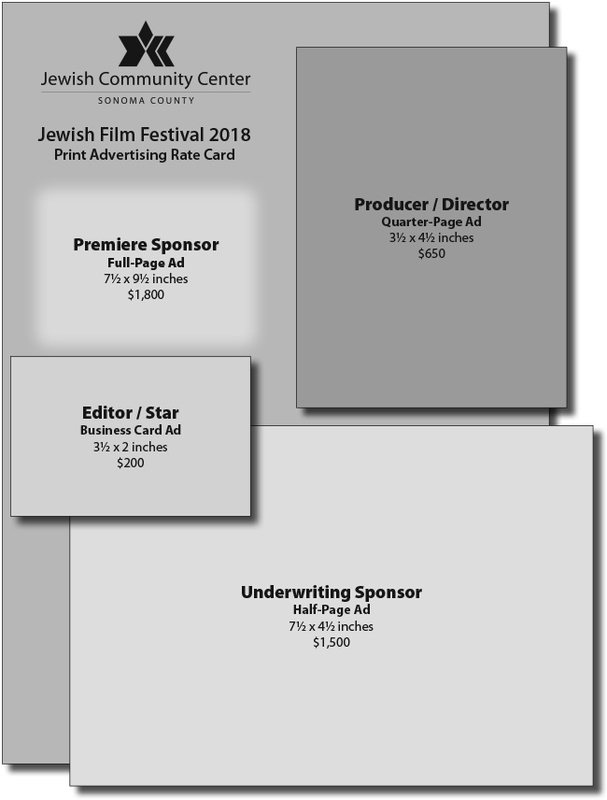 Your logo with a live link on JCC film festival webpage, and in print ads where applicable. Underwrite your choice of film. Your name will be identified with your film. The film festival’s program book has all the film names, information and screening times. It also has acknowledgments to all our underwriters and our raffle donors, a list of all our sponsors, and your ad. 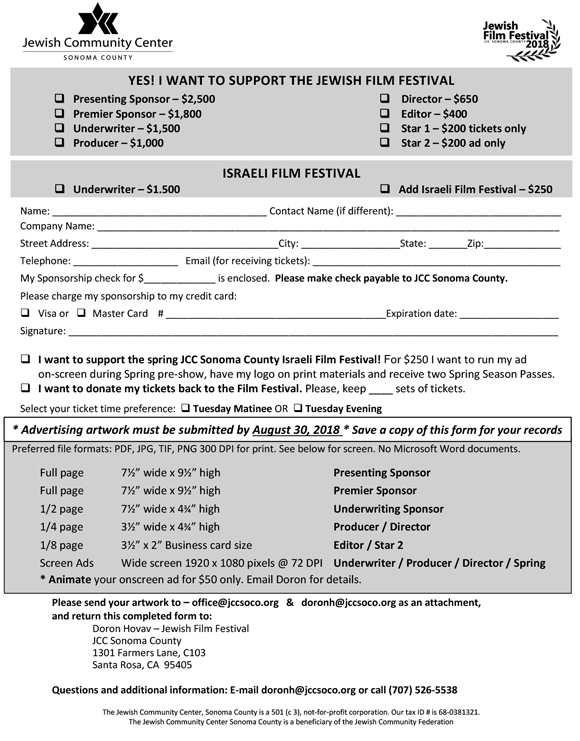 In addition to your Jewish Film Festival sponsorship, we at the JCC Sonoma County would like to invite you to consider becoming a founding sponsor of the Spring Israeli Film Festival, and to have your ad run in the spring pre-show, and receive a season pass to all the films at the Spring festival. And maybe the most import perk – you will get to watch quality Jewish films from around the world right here in Sonoma County. Thank you for wanting to help the local community, and see you at the movies.